I'm not quite sure whether this is an appropriate translation of the German term Quark-Öl-Teig. However, if you are afraid of making yeast dough or if you don't have the time, a dough made of quark and oil is an easy and fast alternative. Quark is a soft curd cheese being widely available in most countries now. This quark oil dough will not stick to your fingers and it doesn't need any time to rise as a yeast dough does. Taste and structure are very similar but the quark oil dough should be eaten freshly baked. It can be used for sweet and savoury dishes, especially for tartes and quiches but also for rolled cakes like 'Mohnstriezel' e.g. I don't think you can make bread out of it but maybe someone will try? Whisk the quark with oil, milk, sugar, vanilla and salt. Mix the flour with the baking powder and add this to the wet ingredients. Roughly incorporate the flour with a wooden spoon or the dough hooks of your hand mixer or food processor. Then knead it all together by hand just until it's smooth and pliable. This is all done very easily and fast. No need to bring the ingredients to room temperature. Slightly grease and flour the baking tin. 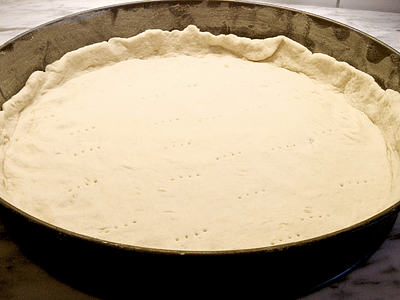 Roll out the dough a bit larger than the tin's diameter, put it into the tin and press it lightly to form a low rim. Prick the bottom with a fork. It's ready now to be topped with whatever you can bake in an oven – apples and nuts, streusel, quark fillings, plums, pears, cherries – the choice is endless. In a preheated oven it will bake around 40 minutes at around 180°C (= 356°F). This is depending on your oven and on the topping. For a savoury dish like a quiche or pizza just leave off the sugar and vanilla, but you may add a little bit black pepper and nutmeg. If you want your dough to have a healthier colour you can add an egg yolk, but then you should reduce the milk accordingly. To cover a complete baking sheet just double the quantity.